Last week I warned you that it would be a terrible review because I wasn’t eating candy. Which is like staring at the box scores every morning thinking maybe, just maybe your favorite ball player hit a homerun yesterday – even though he’ s on the DL. Well this week, after 6 days of literally ingesting nothing but lemon juice, syrup, water and cayenne, I’m back eating candy baby! Trolli Sour Brite Crawler Eggs are all different colors, a rainbow pallette of pastels. 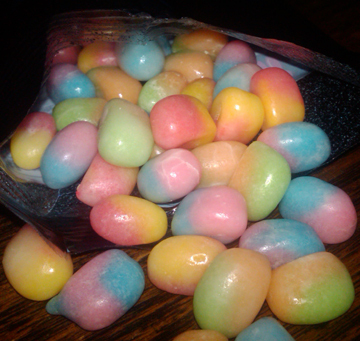 Upon first look, they seem like jelly beans but not such a perfect round shape. When I bit into one I assumed it would have the bean consistency and then melt in my mouth, but nay – it’s a jelly bean shell around a gummi; a small gummi worm is the suggestion from the package. When you start on these, you bite into the soft shell that then gives way to a small and hard gummi worm. And yes, it works. Following the theme: you’re biting into a soft egg shell and eating a worm fetus. I mean – if that doesn’t sound good then what does! Wow these are good. 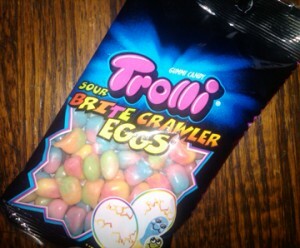 Sour?..uh more like really tart. When you see them in a group picture you might assume there were a ton of different colors and flavors but I’m pretty sure there are only three. And yes my knives need sharpening, but these things were hard to cut through. In a good way. In a good gummy tough way. 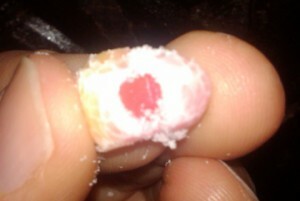 Picture isn’t so great but you can see how the innards are solid gummi. I can’t quite discern the flavors but the red/yellow is cherry something; the pink/blue is berry something; and the orange/green is citrus something. Whatever. It doesn’t matter. They’re good whatever they are. More props for Trolli, the German company who us Gurus thought just plain sucked at gummi. I’d get these again. A lot. I got them at Walgreen’s and I’ll be repurchasing. Best price I could find in bulk is from Groovy Candies. THESE ARE AMAZING!!!!!! I know it’s probably not a good idea but I have at least one bag a week! I’m addicted!!! Good on you, Alexis! Eat up, kid.